A contradiction in reality, finding a Penguin on equator seems like a fantasy. Due to the chilly Humboldt Current, and the Cromwell Current these birds in tuxedos have found a unique home. 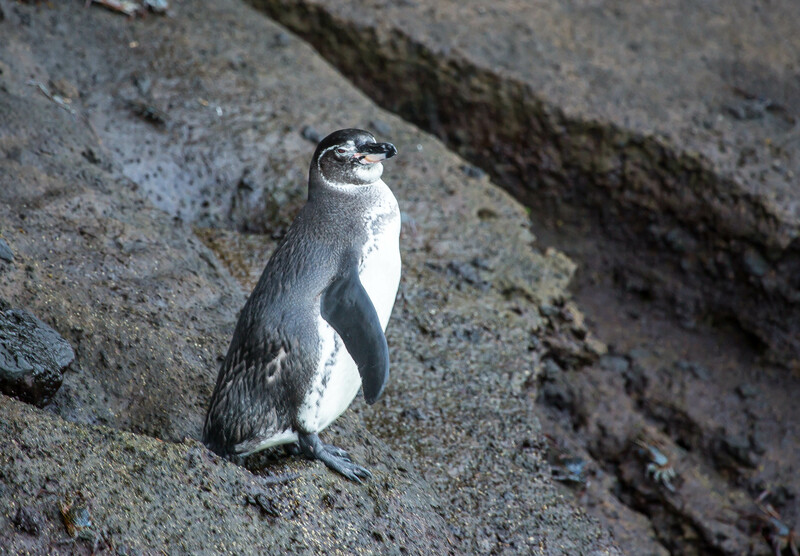 Found primarily along the volcanic rocky shores of the islands of Fernandina, and Isabela, these small penguins are an elegant addition to the rough terrain. 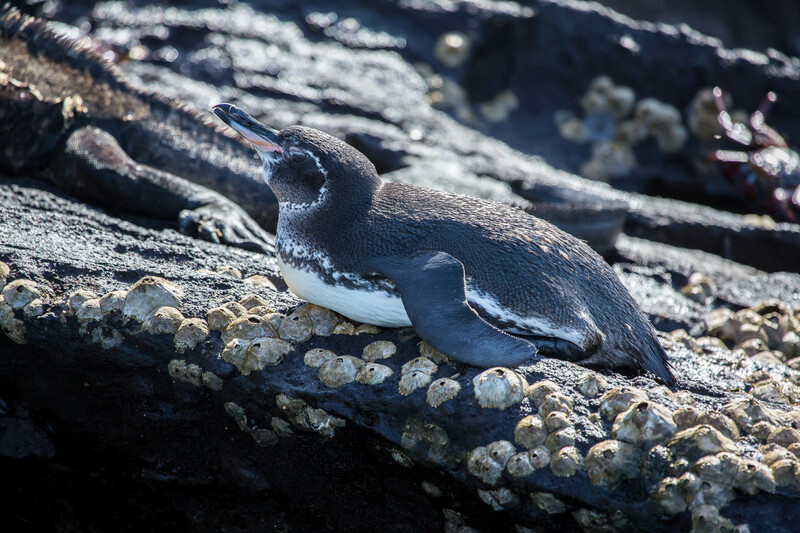 Enjoying the warmth of the sun, the Galapagos Penguins dive into the cool waters to enjoy small schooling fish like sardines and mullet. These penguins are endangered with about 1,000 breeding pairs in the world. 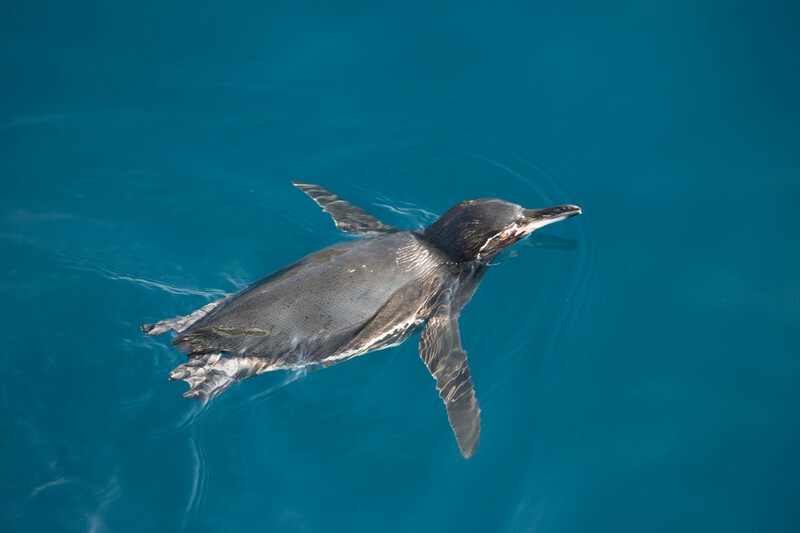 Considered the rarest penguin species, their survival is even more challenging during “El Nino” years. One can actually swim with these penguins when snorkeling in Punta Vicente Roca or Tagus on Isabela Island. Exquisite photos and interesting info too, thank you. Thank you so much Jet ! So happy you enjoyed this post. I’m starting to wonder how the heck they got there. Great post and what amazing images! Wow, thank you so much Cynthia! Oh Emily!!! Beautiful captures that confirm we live in a remarkable world. This trip was truly a surreal experience and many times I felt as if I was on a different world. It shows that nature can be harmonious when man doesn’t intervene. They’re super cute, aren’t they? This is a great and informative post, thank you for bringing light to these cute penguins and their dire state. Only 1,000 breeding pairs! Wow, that’s nothing. They look SO PEACEFUL lounging out like that, gosh those fish must be satisfying (sometimes I feel like that & I hope you’re getting some of that peaceful sound cuz you’ve definitely put in some good work with your photography). I also really appreciate this post because they make me feel the super blue and warmth they’re enjoying. Don’t get me wrong, the weather’s been better but gosh that looks nice. You are truly such an amazing writer LP. When you see them, you feel as if there are tons of them around. But to read that such few actually existed made me appreciate them all the more. All of the islands are so peaceful. A wonderful place to rediscover yourself. These little fellows in formal are just the cutest things – I had a chance to walk among the penguins and it’s hard not to give them human characteristics. Oh wow..where did you get to play with penguins? They are truly the cutest things Lynne. Thank you so much. On Otway Sound in southern Chile the Magellanic penguins have a colony. There were boardwalks throughout and the penguins would come within feet of us in some cases. Charming little fellows. they’re cute little critters, aren’t they? thanks for the info and the delightful pictures! Truly my pleasure Kate, and so happy you enjoyed these.